Win a Nautel Prize Pack! Do you have a great story about your Nautel navigation equipment? We’d love to hear about it! 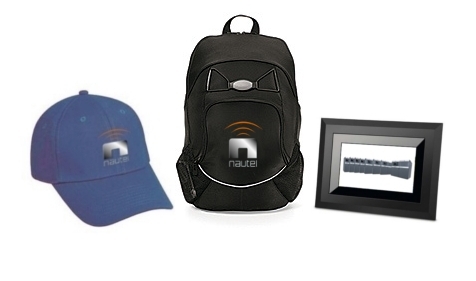 The first ten people to submit a qualifying* Nautel story will instantly win a Nautel Prize Pack consisting of a Nautel Laptop Commuter Bag, Digital Picture Frame and Nautel Baseball Hat. Telling your story only takes a few minutes and a few simple steps. We’ll need to know who you are and get your permission to use the story. Then we’ll ask a couple of questions to help you tell your story. Finally we’ll give you the opportunity to upload a photo or radio station logo. *A qualifying story must contain contact information (name, company, etc. ), be at least 500 words in length and have a relevant picture attached. Only one submission per author will be eligible to recieve a Nautel Laptop Commuter Bag as part of the first ten submission promotion.